mARTina (Homepage) wrote: perfect. the red color is great and you have make a very good architecture shot. Turnbill (Homepage) wrote: Superbly done. 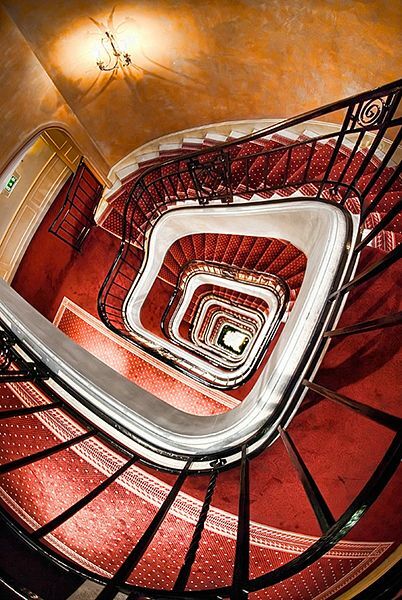 Alexandra (Homepage) wrote: What a great capture...you really captured the perspective perfectly! john (Homepage) wrote: look confusing but really nice! Chris Franklin (Homepage) wrote: Great colors. I like the way the lines draw my eyes into the photo. Arnd (Homepage) wrote: Great perspective and superb red tones. This stairway is a true eye-catcher! Marcie (Homepage) wrote: Fantastic point-of-view and framing. It makes me dizzy..just to look! John Maslowski (Homepage) wrote: Impressive image, love the spirals and patterns. Excellent perspective with beautiful colors. Frida (Homepage) wrote: Woho this makes me dizzy :-) Its a beautiful stairway. Guido (Homepage) wrote: Certo che te ne sei fatto di scalini per scattare questa bellissima foto! Ne è valsa sicuramente la pena. Belli i colori del pavimento ma anche delle pareti. Beat (Homepage) wrote: this is a spectacular view you captured here. good job!